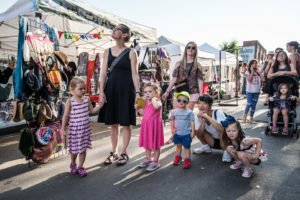 When coming to a street festival in town especially as a parent, there can be so many things to worry and wonder about, that we felt highlighting the unique ways our festival is kid and family friendly made sense. First off, we try to make sure our festival is appealing to as many cultures and ages as possible- so we believe there are many things that you will find if you walk around our event, but if you are particularly looking for some kid fun, here are a few things not to be missed! We definitely recommend showing up early to catch our Rescue Dog Fashion Show happening at 12:30 pm presented by Patton Avenue Pet Company and Mountain Pet Rescue. What kid at any age wouldn’t want to see cute animals in outdoor gear that are available to take home in our pet adoption that will be held directly after. On a slight tangent here, we think it’s important to note that it is a city-wide rule that dogs and pets are not allowed in festival property except under special permissions like we have for this program- so be sure to get your animal fix early in the day if you are a pet lover! 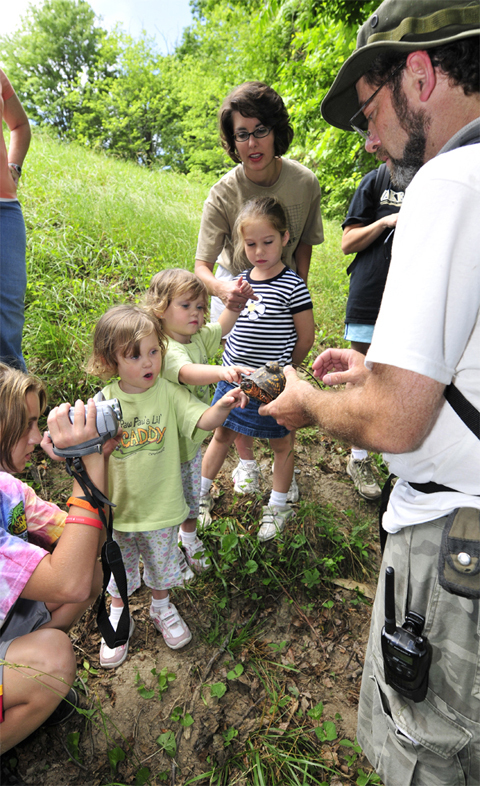 The only other animals you might encounter at the festival are some rehabilitated and at times misunderstood native wildlife species such as snakes, turtles, and lizards that are brought out by Earthshine Nature Program. You will learn all about them and the important roles they play in nature and their interconnectedness to the web of life which is fun and informative for the whole family. We also know the entire Interactive Arts Arcade and CommUnity Corner are going to have some booths and activities your whole family won’t want to miss including seed bomb making, some forest defender superhero games by Dogwood Alliance and many other activities provided by the Asheville Science Museum, Compost Now, Art Studio World (face painting and instrument making) LEAF Community Arts and more. If you engage in even a fraction of the activities found in our Interactive Arts Arcade or CommUnity Corner with your family you might need to grab some lunch from one of our food vendors, a refreshing lemonade (from MacDaddy’s Lemonade) or ice cream (from local favorites The Hop) and take a seat at our CommUnity stage to watch Asheville Vaudeville do some all ages vignette performances tying arts and sustainability together. 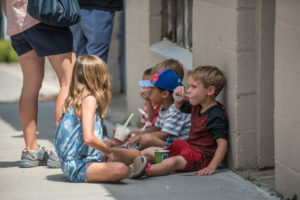 Once you’ve taken a nice reprieve from the sun it’s time to bring your kids down ArtRow to marvel and see the amazing creative art vendors or to possibly to tie-dye some old t-shirts you bring in to Wax On Batik and Dye Studio booth. Be sure to also pop by Toybox’ Theatre‘s tent because he will be doing spontaneous puppet performances throughout the day! As you wander it’s likely you will encounter some of the roving performers we have such as juggling, giant puppets, faeries and hula hoopers to delight and engage your family with some fun. There is also slacklining, and boffing for the more adventurous kids (or children at heart, we don’t discriminate!). Now, parents, this one is directly for you…. What’s better than experiencing an amazingly creative and local street festival with your whole family all day? Experiencing an amazingly creative and local street festival with your whole family MOST of the day, while getting a few minutes of “adult time” (interpret as desired!). If that statement rings true for you, we even have that option for parents in our new offering, our Kids Garden Drop-in Daycare! For $10/hr up to 3hrs, you can leave your kids (3-12 yrs old) on the festival grounds (between 12 pm – 6 pm) in a secure and engaging area so they can enjoy themselves parent free while you grab those few minutes to yourself. While kid-free, this would be the perfect time for you to pop into Octopus Garden to check out some music, to get that acupuncture/massage you were dying to get or to spend some time dancing unabashedly (the kind of dancing that would utterly embarrass your kids) with your friends! 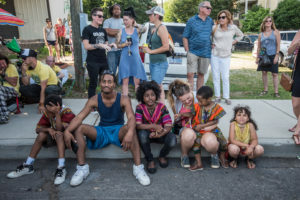 When you scoop your kids from our drop-in daycare it may be time for some dinner with one of our tasty food vendors, and some more dancing in the streets with the whole family. If your kids are the kind that can last as long as (or longer than) you- we definitely encourage you to stay for the lantern parade that will be occurring at 9 pm from the Vision Stage (Urban Orchard’s new South Slope loading dock). Street Creature Puppets and Pink Mercury will be leading a flameless lantern parade directly at 9pm. It is VERY important to note that NO OPEN FLAMES ARE ALLOWED IN THE EVENT, but you are encouraged to make a lantern (here’s a chance to take your kids to the Puppet club to make one before the event!) or bring a flashlight or closed flame battery candle, glow sticks or something else to participate in the parade which will weave through the streets ending at the main stage where you can dance the last hour of the event away with Big Sam’s Funky Nation, our ONLY out of town group. They hail from New Orleans are prepared to bring some funk the whole family can get behind! We truly believe that no matter what route you go for this family-friendly festival you and your kids will be talking about and looking forward to this event as a family for years to come.